The PARKLAND New Zealand Speed Golf Open returns this weekend with another record breaking field expected to compete from 2-3 of February at the Whitford Park Golf Club. 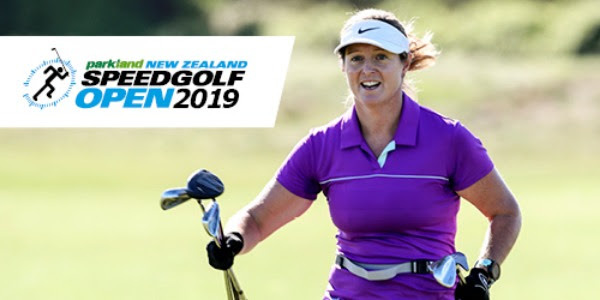 The 2019 championship has many new players excited for silverware with New Zealand’s number one speedgolfer and defending champion Jamie Reid having to withdraw due to family commitments which opens the door for a new name to be etched in history. The 40-strong field of professionals and former national running champions includes last year’s runner-up by just 21 seconds, Josh Longley who starts as hot favourite alongside 2016 world champion Jamie Young returning to the field. One of the country’s leading amateurs and Toro Interprovincial champion team member from Northland, Luke Brown is also trying his hand in the growing format which is open to athletes of all ages and abilities regardless of your running of golf skills. Liz McKinnon returns to the women’s field as the world number two looks to reclaim her crown off Susan Farron who won in style at Windross Farm last year. McKinnon remains undefeated at this event after not being able to participate last year. This is Parkland Product’s third year involved with the event as they share the same passion to grow speedgolf as a well-recognised alternate format for the game and attract a new breed of participants who are keen to combine their running and golf interests in a time limited world. “We are thrilled to be able to support the development of the sport and some extremely successful kiwis on the world stage by sponsoring this local event,” explained Ian MacLeod, General Manager of Parkland Products. The event has added a more social element to the mix this year with the opportunity for sports clubs or businesses to get a team together and go head to head in a four-hole 'Fun Run Challenge' after tournament play finishes on the opening day. In teams of four, each player tackles one hole as fast as possible before tagging their teammate on the next tee. There is also a chance for everyone to join the fun on Sunday to play a casual nine holes for beginners to experience the new format and with free entry. The main draw for day one will also feature ex-Black Stick captain Simon Child who will look to use his hand-eye coordination in a different manner this weekend. The 260 capped Black Stick could be one to watch and will be joined by other diverse sports elite who gather to try their hand at this exciting format of the game. Whitford Park has great facilities for the event with spectators able to view half of the holes and monitor competitors progress from the clubhouse, whilst the 18th hole finishes in an amphitheatre setting. Coupled with a small Auckland heatwave, conditions will be stunning and a great chance to use the swimming pool to cool off afterwards. Parkland Products is the very best provider of a comprehensive range of world-class products and services necessary to achieve quality turf, landscaping and efficient water management. Parklandprovides world class mowing, turf renovation, vehicles and related equipment, irrigation (design & build systems and products), and follow-up servicing on all products and services.